For most small business owners, managing accounting tasks can be a challenge. Finances are typically not the most appealing part of the job. The below small business accounting checklist is a comprehensive guide to help you easily navigate the tasks involved. Keeping it on hand will help keep you on track as you move through the year. The accounting checklist is also a great tool for bookkeepers. Consult the infographic at the bottom of this post as a quick reference. And download and print the list below; it’s a handy guide that will help keep your small business in sound financial shape. We’ve developed the accounting checklist with tasks for each day, week, and month. We’ve also included quarterly and yearly tasks. Simply consult the checklist on a regular basis, and you’ll be a small business accounting guru before you know it. Before you cut any checks or plan to outlay cash for new or longer-term expenses, check your cash balance. You need to know that you have enough in your accounts to cover any checks that you plan to write. Use your accounting software platform to verify your balances and get a handle on your cash position each day. Understanding your existing cash position allows you to make immediate spending decisions. Being aware of your accounts receivable and accounts payable will help you plan for new and future expenses, and give you a clear picture of what your cash position will look like across the upcoming month. 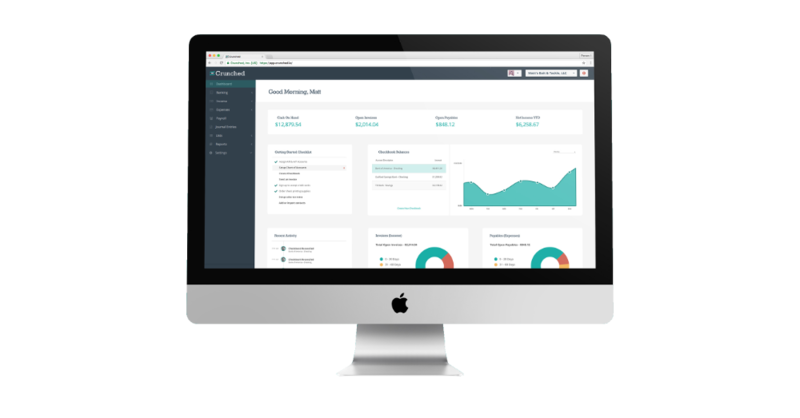 Your accounting software will show you any outstanding invoices, and their totals. Set time aside each week to manage your accounts receivable. Use your accounting software to prepare your customer invoices and send them out. By now, you’ve likely established your payment terms so verify the terms of each client before sending to ensure you’re applying the correct due dates. If you haven’t yet established payment terms, go here for best practices. This is the fun part. Set time aside each week to apply payments from customers to their open invoices. Partial payments should also be applied. Accounting software makes this process easy. Ensuring that all customer payments are applied within the system will help paint a clear picture of your cash flow. New invoices are likely coming in at various times. Set a specific time aside to enter these invoices into your accounting software so they are easily accessible when it comes time to pay them. By having all of your bills entered into your accounting software on a regular basis you’ll have a clear snapshot of you financial position week to week. Getting paid is fun, but, of course, you also need to pay out. Managing your accounts payable on a weekly basis alongside accounts receivable will help keep your accounting balanced and accurate. Make sure to keep an eye on the payment terms that each of your customers requested. Paying past the due date may result in late payment penalties. If you have employees, then you’ll need to spend time once per week on payroll. If you’re using an automated system through your accounting software, use the platform to review and verify employee hours, process and print payroll reports, and file payroll taxes and information pertaining to direct deposit. You can then print and distribute paychecks. Cash flow is the heart of any small business. Forecasting your cash flow and cash requirements over the week and month ahead will help you understand how much money will be coming in and going out of your business. A cash flow statement will clarify where you stand so you can confidently pay your immediate bills and plan for future expenses. Accounting software allows you to generate cash flow statements easily. To get a better handle on managing cash flow, and other small business financial management essentials click here. Businesses that operate with inventory need to stay on top of ordering on a regular basis to ensure products are in stock. Take the time each week to review your inventory counts and place orders when levels are reaching a low point. To help aid the order process, review how long it took for each product to sell through, and choose the quantity of your order accordingly. This way, you won’t sit on inventory, tying up cash flow, for any longer than you need to. The main goal of reconciling your bank accounts is to establish an accurate balance by managing your deposits in transit and outstanding checks that my not be reflected on your current bank statement. For the reconciliation to provide an accurate figure you’ll need to ensure that all your business accounting transactions are accurately recorded into your accounting software. Your accounting software can easily assist in reconciling your checkbook when it comes time to do so. Aged receivables are payments on invoices that are overdue from customers. Similarly, aged payables are payments that you owe other companies for products or services. Aging reports can be used to keep track of these payments and give you an overview of where they stand. Take some time each month to review your aged accounts so you don’t get too far behind on payments, and you can take necessary steps to collect when needed. Set a time each month to do an inventory count and review in detail what has sold and what hasn’t in the past month. Use what you learn during these reviews to make adjustments. Payroll tax requirements vary at the federal, state, and local level. Payment dates don’t always coincide with the timing that you’ve established to pay your employees. Make sure to have a handle on the tax payment dates, and then withhold, report, and deposit payroll taxes by the necessary dates. You’ll be responsible for paying into Medicare, disability, income tax, and social security for each of your employees. Sales tax is governed by your State. Be sure to verify your States regulations as each State mandates different sales tax requirements. Most jurisdictions require that tax returns be filed, and liabilities be paid, on a monthly or quarterly basis. Filing is a relatively simple process; however, it’s always a good idea to consult with your accountant regarding tax issues. Your profit and loss statement (otherwise known as an income statement) shows revenue, expenses, and profits or losses during a given period of time (month, quarter, etc.). Set aside some time each month to compare your planned numbers (if you have a budget set) against how much you actually spent. If you don’t have a budget in place, you can review the income statements year over year. Make adjustments if you’re spending more or less than planned. To learn more about income statements and the basic accounting reports click here. Your company’s balance sheet is a snapshot of your assets and liabilities. The difference between the two lets you know how much equity you have in your small business. Comparing one date against another on your balance sheet – month over month, for example – will help you identify any dramatic ups and downs. You can then make adjustments as needed. Each quarter, you should take a close look at your profit and loss statement to get a firm understanding of the financial condition of your small business. This evaluation should look at your profitability, profit spending habits, asset stability, and the difference between revenue and expenses. The goal is to identify any trouble areas and make adjustments that will help the business be more profitable. A new quarter comes around fast. Don’t get caught off guard when it comes time to make your quarterly payroll payments. Most States require quarterly reports and payment, but check with your State and work with your accountant or payroll provider to determine your specific State and Federal requirements. Your accounting software can help you quickly retrieve payroll journals, cash requirement reports, and payroll tax returns. In most states, you’re required to file sales tax returns and pay each month if you have a high volume of sales. Otherwise, you must pay quarterly. Since laws vary between states, check with yours to determine what that volume of sales must be. And, of course, it’s always a good idea to consult with your accountant when it comes to taxes. As a self-employed small business owner, you’re responsible for making quarterly income tax payments. The process of calculating your estimated tax obligations starts by estimating your anticipated adjusted gross income, your deductions, and any credits you may have received during the year. While you will want to calculate all of those figures exactly, you can use last year’s income figures as a guide. For more information about estimated taxes, click here. Take a final look for the year at any accounts receivables that are significantly past due. If you think there are invoices that will never be paid, take this time to decide what your next steps should be. There are two ways you can go here: Write invoices off as a deduction, or hire a collections agency to go after the money. In accounting terms your inventory is an asset. Once per year, before filing your year-end taxes, you should review your inventory and determine which items are unsellable. After you’ve determined the value of each unsellable inventory item, you can take a write-down on the total value of those items, and deduct that figure from your year-end taxes. Each year, small business owners are required to report annual earnings for full-time employees and independent contractors. You need to mail out W2s to full-time employees and 1099s to independent contractors by their due date. Be sure to check with the IRS as due dates have changed in the recent years. This is a long list, but don’t worry! Crunched accounting software can automate the financial management process, and make it easy to manage your books all year long. Check out the below infographic for the step-by-step process, and download the list to print and keep on your desk for easy reference. Please include attribution to crunched.io with this graphic.